Four of the first five presidents of the United States came from Virginia. They were George Washington, Thomas Jefferson, James Madison and James Monroe. The second president, John Adams, was a New Englander. 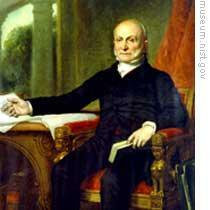 In the election of eighteen twenty-four, his son, John Quincy Adams, was one of four leading candidates for president. At the same time, the West began to make its presence felt in national politics. This week in our series, Maurice Joyce and Stewart Spencer discuss the election of eighteen twenty-four. 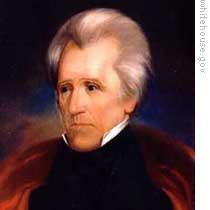 General Andrew Jackson of Tennessee got the most electoral votes: ninety-nine. But he needed one hundred thirty-one to win a majority. The secretary of state, John Quincy Adams, was second with eighty-four votes. Treasury Secretary William Crawford received forty-one. And Henry Clay of Kentucky got thirty-seven. None of the candidates got a majority of the votes. And the decision went to the House of Representatives. The House voted on only the three top candidates for president. 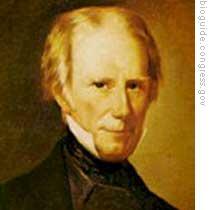 The most powerful man in Congress -- Henry Clay -- was not, therefore, a candidate. But Clay's support would be the greatest help any of the candidates could receive. All three wanted his support. Treasury Secretary Crawford had suffered a serious illness before the election, and his health was bad. Clay felt he could not support him for that reason. This left Adams and Jackson. Clay did not agree with all of Adams's policies. But he did believe Adams had the education and ability to be president. Clay did not like Jackson, the hero of New Orleans during the War of Eighteen Twelve. He knew Jackson was poorly educated and easy to anger. Clay did not think Jackson would be a good president. So Clay decided to support Adams for president. He said nothing about this for a time. Several of Clay's friends visited Adams. They told him that Clay's supporters in the West would be pleased if Adams, as president, named Clay as secretary of state. Adams told them that if the votes of the West elected him president, he would put a westerner in his cabinet. But he would not promise that the westerner would be Clay, or that the cabinet job would be that of secretary of state. Clay still had not said publicly which candidate he supported. But it became known that his choice was Adams. Late in January, the Philadelphia newspaper Columbian Observer published an unsigned letter. The letter charged that Clay and Adams had made a secret agreement. Clay, the letter said, would give his support to Adams. In exchange, Adams would name Clay his secretary of state. Clay was furious. He not only denied the charge, but offered to fight a duel with the letter-writer, should his name be known. Much was made of the charge that Clay had sold his vote to Adams. But no proof was ever given. Clay demanded an investigation. But the man who accused him in the newspaper letter refused to say anything. Clay was sure Jackson's supporters were responsible. Snow was falling in Washington on the morning of February ninth, the day that Congress would elect the president. At noon, members of the Senate walked into the House of Representatives. The electoral votes were counted, and it was announced officially that no candidate had won. The senators left, and the House began voting. Each state had one vote for president. Adams was sure he would get the votes of twelve states. Crawford had the votes of four and Jackson, seven. New York was the question. Seventeen of the New York congressmen were for Adams, and seventeen were opposed to him. Adams needed just one of these opposition votes to get the vote of New York and become president. One of those New Yorkers opposed to Adams was a rich old man who represented the Albany area, Stephen Van Rensselaer. 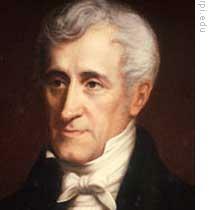 Although Van Rensselaer had supported Crawford or Jackson, he really was not sure now whom to support. Henry Clay had taken the old man into his office that morning and talked to him. Daniel Webster also was there. They both told the New York congressman that the safety of the nation depended on the election of Adams as president. Clay and Webster told the old man that his was the most important vote in the whole Congress. That Stephen Van Rensselaer would decide who would be president. The old man's head was not too clear after listening to Clay and Webster. He still did not know what to do. When the New York congressmen voted, Van Rensselaer still was not sure of his choice. And he put his head down on his desk and asked God to help him make the right choice. After this short prayer, he opened his eyes and saw on the floor at his feet a piece of paper with Adams's name on it. Van Rensselaer picked it up and put it in the ballot box as his vote. This gave Adams the vote of the state of New York and made him president of the United States. A committee of congressmen was sent to Mister Adams's home to tell him of the vote. One member of the committee described the secretary of state: "Sweat rolled down his face. He shook from head to foot and was so nervous he could hardly stand to speak." Later in the evening, Adams had control of himself. President Monroe gave a big party at the White House. Adams was there. So was Jackson, and Clay. During the party, Adams and Jackson met face to face. Jackson had his arm around a young lady. "How do you do, Mister Adams," said Jackson. "I give you my left hand, for the right -- as you see -- is devoted to the fair. I hope you are well, sir." "Very well, sir," answered Adams, coolly. "I hope General Jackson is well." Two days later, Adams told President Monroe that he had decided to offer the job of secretary of state to Clay. He said he was doing so because of the western support he had received. Clay thought deeply for a week about the offer. He asked a number of friends for advice. Most of them urged him to take the job. They told him that a man of the West was needed in the cabinet. And they said being secretary of state would greatly help his own chances of becoming president some day. Clay accepted the offer. He said he would serve as Adams's secretary of state. Until now, General Jackson had refused to believe the charges that Clay had sold his vote to Adams for the top cabinet job. Now he was sure of it. He wrote to a friend: "Was there ever before such bare faced corruption. What is this trade of vote for office, if not bribery?" Many of Jackson's supporters did not believe John Quincy Adams had the ability to be political leader of the party. They believed that Clay would seize the party leadership and use this power to help himself become elected the next president. Jackson, himself a senator, showed his feelings when the Senate was asked to approve Clay as secretary of state. He voted no. And thirteen other senators joined him against the nomination. But they were too few to prevent Clay from getting the job. The next presidential election was four years away. General Andrew Jackson promised himself this would be one election he would not lose. Before he left Washington to return to Tennessee, Jackson wrote a letter that soon became public. "I became a soldier for the good of my country," Jackson wrote. "Difficulties met me at every step. I thank God that it was my duty to overcome them. I am in no way responsible to Henry Clay. There is a purer court to which I will put my case -- to the intelligent judgment of our patriotic and honest voters." General Jackson returned to Nashville to rest and plan. He was still a senator, and he questioned if it might not be best for him to resign from the Senate. He would be free of Washington politics and able to build his political strength for the election in eighteen twenty-eight. He decided to resign. Our program was written by Frank Beardsley. The narrators were Maurice Joyce and Stewart Spencer. Transcripts of our programs along with podcasts and archives of MP3s can be found at www.unsv.com. Join us each week for THE MAKING OF A NATION – an American history series in VOA Special English. the history makes the background of presidential elections clear that they all had furious compitition before taking office. it more or less certifies my philosophy that things are ofentimes decided at the back paltform.